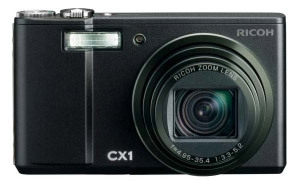 A new member of Ricoh’s range of 7x zoom point-and-shoot compact cameras, the £300 CX1 offers a handy 28-200mm zoom lens, 9 megapixel CMOS sensor, full res continuous shooting at 4 frames/sec and a 3 inch HVGA LCD screen displaying 920K pixels. The big news is the onboard electronic wizardry that Ricoh claims will give the camera a massive dynamic range of 12 EV, which is closer to what the human eye sees. This is achieved via a DR shooting mode which takes two photos at different exposures and merges them to create a single image with expanded dynamic range. We’ll be giving the camera a good test drive over the next week or so, but while the battery charges up, we’d thought we’d share our first impressions with you. 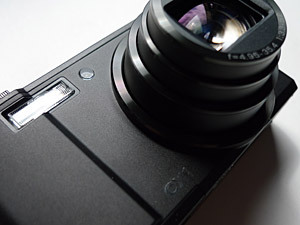 Based on their earlier R10 camera and displaying Ricoh’s trademark style, the CX1’s minimalist, squared off design is pleasing to the eye and feels solid to the touch. Weighing in at 180g, and measuring 101.5 mm (W) x 58.3 mm (H) this is a fairly pocketable number (unless you favour the indie-kid spray on drainpipe trouser look). Our review model came in matte black, but there’s also silver and bronze versions available, all of which give off an nicely understated retro look, with an old-school etched metal top plate suggesting that the camera could take the odd knock or two. 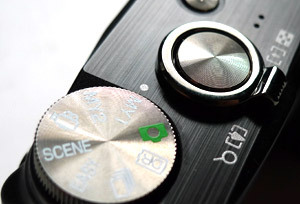 There’s not a lot to see on the top of the camera, with just a recessed power on/off switch, combined shutter release with zoom ring surround and a solid, metal mode dial (how we wish our Lumix LX3’s dial felt this rugged). The back of the camera is similarly no-nonsense with the big LCD display to the left, flanked on the right by a strip of four function buttons. At the top right is a clickable four way joystick supplemented by a small rubberised area for extra grip, with a small ‘play’ button below – and that’s your lot. The battery and SD card is accessed via a flap at the bottom of the camera which felt sturdier than most, with USB/AV ports lurking behind a rubberised cover on the side wrapping up the physical bits and bobs of the camera. Next week, we’ll be putting the Ricoh through its paces and seeing how it copes with a weekend in darkest Dorset.